La Plata, in Buenos Aires, Argentina, is a 53,000-seat capacity stadium originally opened in 2003, is formed from the intersection of two 85 m circles, with 48 m between their two centers. Designed by architect Roberto Ferreira, the stadium is receiving a 312,545 square-foot tensile roof featuring Birdair’s steel cable systems and PTFE, a Teflon®-coated woven fiberglass membrane. Around the perimeter is the octet steel tube compression ring consisting of 45 octahedron/tetrahedron modules, forming a load bearing ring that will support the roof. The top chords of this ring are the starting line for a dome formed by a triangulated cable network. The network features tensioned steel cable hoops at three different levels, together with vertical columns, diagonal cables, and ridge cables, thus deploying a pre-stressed tensegrity design. True to its tensegrity deployment, PTFE panels will be added as cladding, and will not play a supporting function; they will float in the tensegrity structure, pulled stiff in the same way that a drum head is tautened. Below are some selected images of the Birdair roof. The images are all property of Birdair and can be found on their website. Below, a rendering of the roof with the fiberglass cladding in place. http://www.birdair.com/construction/la_plata_stadium.aspx A four-cable tension member surrounds the roof. [[file:La_Plata_Birdair_cable_and_fabric_roof_stadium_quad_cable_stay.jpgLa Plata, in Buenos Aires, Argentina, is a 53,000-seat capacity stadium originally opened in 2003, is formed from the intersection of two 85 m circles, with 48 m between their two centers. Designed by architect Roberto Ferreira, the stadium is receiving a 312,545 square-foot tensile roof featuring Birdair’s steel cable systems and PTFE, a Teflon®-coated woven fiberglass membrane. Around the perimeter is the octet steel tube compression ring consisting of 45 octahedron/tetrahedron modules, forming a load bearing ring that will support the roof. The top chords of this ring are the starting line for a dome formed by a triangulated cable network. The network features tensioned steel cable hoops at three different levels, together with vertical columns, diagonal cables, and ridge cables, thus deploying a pre-stressed tensegrity design. True to its tensegrity deployment, PTFE panels will be added as cladding, and will not play a supporting function; they will float in the tensegrity structure, pulled stiff in the same way that a drum head is tautened. 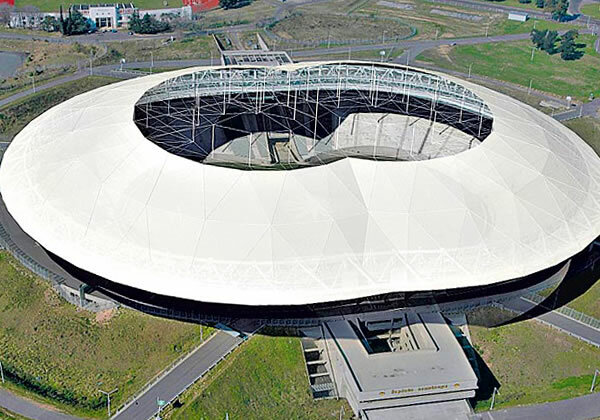 [[file:La_Plata_Birdair_cable_and_fabric_roof_stadium_complete_rendering.jpg|thumb|250px|none| http://www.birdair.com/construction/la_plata_stadium.aspx A four-cable tension member surrounds the roof. 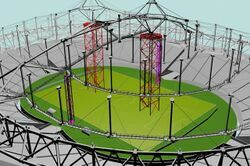 [[file:La_Plata_Birdair_cable_and_fabric_roof_stadium_quad_cable_stay.jpg|thumb|250px|none| http://www.birdair.com/construction/la_plata_stadium.aspx Schematic of the roof's frame, perspective view. 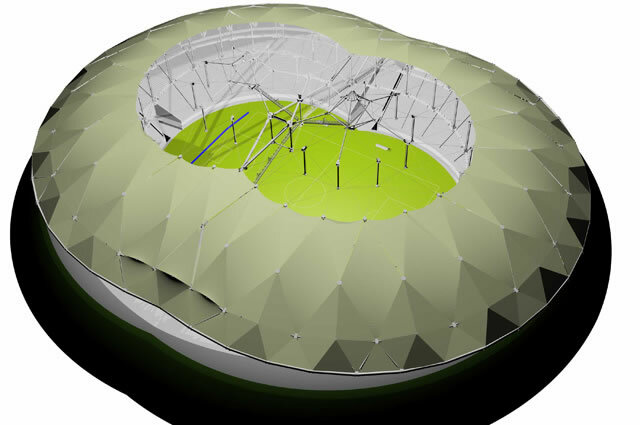 [[file:La_Plata_Birdair_cable_and_fabric_roof_stadium_frame_schematic.jpg|thumb|250px|none| http://www.birdair.com/construction/la_plata_stadium.aspx Schematic of the roof's frame, top view. [[file:La_Plata_Birdair_cable_and_fabric_roof_stadium_frame_schematic_from_top.jpg|thumb|250px|none| http://www.birdair.com/construction/la_plata_stadium.aspx Detail of the octet ring. File:La Plata Birdair cable detail.jpg A view of the central hub on a scaffold, with some cables in place. 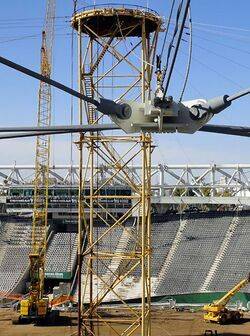 [[file:La_Plata_Birdair_cable_and_fabric_roof_stadium_central_hub_scaffold.jpg|thumb|250px|none| http://www.birdair.com/construction/la_plata_stadium.aspx Cables dangle from the ring, ready to attach. [[file:La_Plata_Birdair_cable_and_fabric_roof_stadium_cables_dangling.jpg|thumb|250px|none| http://www.birdair.com/construction/la_plata_stadium.aspx A close-up of one of the tensegrity struts. http://www.birdair.com/construction/la_plata_stadium.aspx Schematic of the roof's frame, perspective view. La Plata Birdair cable and fabric roof stadium frame schematic. http://www.birdair.com/construction/la_plata_stadium.asp Schematic of the roof's frame, top view. La Plata Birdair cable and fabric roof stadium frame schematic from top. http://www.birdair.com/construction/la_plata_stadium.aspx Detail of the octet ring. 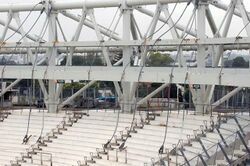 La Plata Birdair cable and fabric roof stadium central hum scaffold. 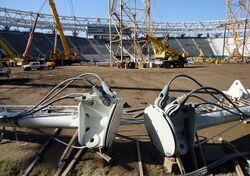 http://www.birdair.com/construction/la_plata_stadium.aspx Cables dangle from the ring, ready to attach. La Plata Birdair cable and fabric roof stadium cables dangling. http://www.birdair.com/construction/la_plata_stadium.aspx A close-up of one of the tensegrity struts. La Plata Birdair cable and fabric roof stadium strut end closeup.